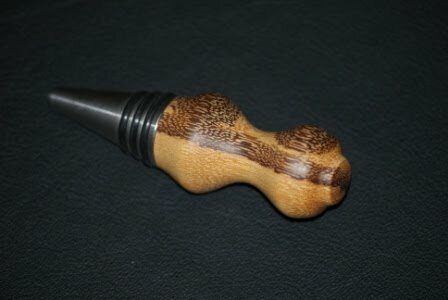 In my previous post entitled "Wine Stoppers - The Good, the Bad and the Fugly" I provided examples of Bad and fundamentally Ugly wine stoppers. 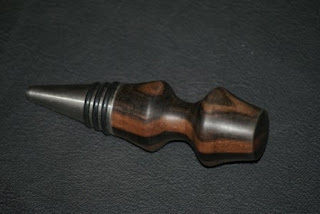 In this post I will describe the process I follow to make Good quality wine stoppers. In my mind the most important part of making a good wine stopper is the component that goes into the bottle itself - namely the stopper. I was surprised to discover that sourcing components of this calibre is all but impossible, primarily because the bulk of the North American market is obsessively price driven and focussed solely on finding the cheapest stuff available. Well, seek and Ye shall find because this cheap stuff is everywhere. In fact it is now so prevalent that it's flooding the market faster than consumers can wear it out and ship it off to landfill. From a low price perspective Cork stoppers are a popular option, but cork is soft and quickly wears out from repeated use. Cork is also absorbent. Who wants to repeatedly use stoppers that have been saturated again and again with stale beverage from bygone servings? As an alternative to Cork there is also an abundance of metal stoppers out there, but most of these are made of low grade steel that has been plated to look presentable. And as you can see in the photo below this plating will also eventually bubble and dissolve over time. Do you really want this coming in contact with your wine? This leaves stainless steel, but thorough research will point out that not all stainless is created equal. The differences are explained in this link, but to summarize: the best material available for making wine stoppers is FDA food grade 304 stainless steel. The stoppers I use are milled from solid billets of this material, with the triple seals made of FDA grade nitrile that are fitted into precision machined grooves. 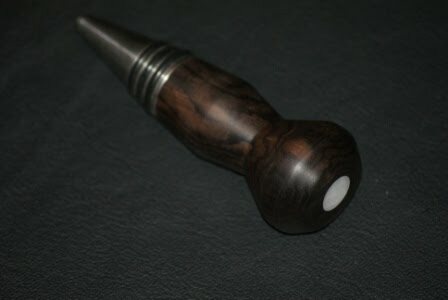 The wine stopper shown here measures 3-1/2" long x 1-1/8" dia., and the turned handle has been crafted from figured Marblewood. 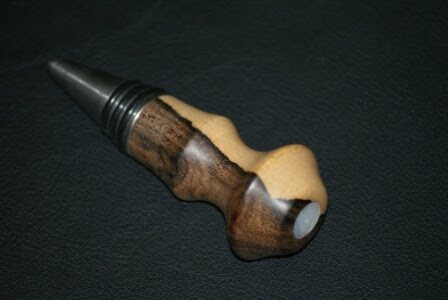 This wine stopper measures 3-3/4" long x 1-1/4" dia., with the turned wood portion being Blackwood. The end is inlaid with Mother-of-Pearl. This Ziricote stopper is also inlaid with Mother-of-Pearl, and it measures 3-5/8" long x 1-5/16" dia. 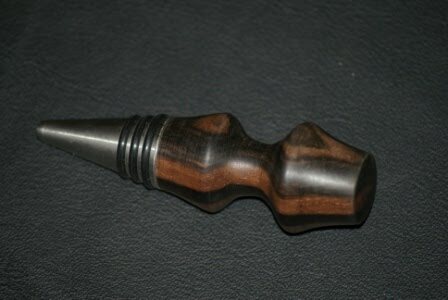 The handle on this stopper has been turned from a block of solid Macassar Ebony. Together with the stainless steel end it has an overall dimension of 3-5/8" long x 1-1/8" dia. 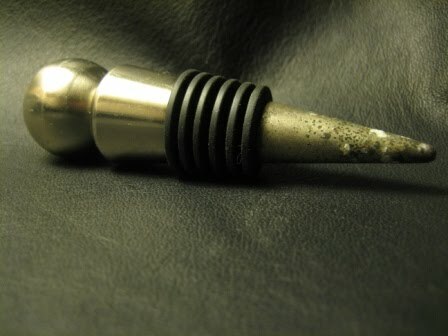 Each wine bottle stopper I make is securely assembled by means of an internal machine screw that acts as a mechanical fastener. After turning on a lathe the solid wood is sanded smooth using progressively finer grits of sandpaper. After careful inspection to ensure all imperfections are removed the wood is then sealed with a special micro-crystalline wax imported from England. This is a specially formulated wax that is used extensively by art galleries, museums and antiques restorers on their finest quality pieces. 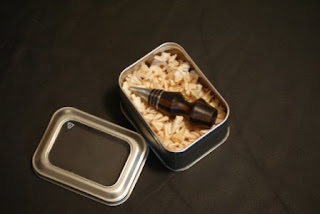 Each stopper comes with its own tin box measuring 4-1/4" x 3-1/8" x 2-1/2" high. Prices range from $45.00 to $50.00 each. Without question these are high quality stoppers made to last.